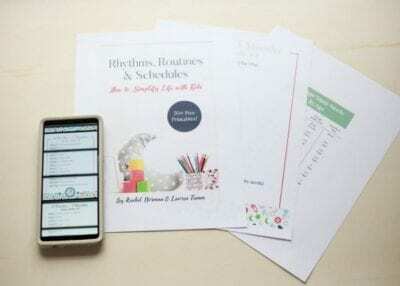 Here is another installment of a sample routine or schedule. Know that these samples take into account “optimal” meal times and nap times according to common wisdom, but of course, every family is different. I love me some 2 year olds. I mean… they’re just *that* much easier than 1-year-olds (the hardest age for me) and they are so busy. Developing skills, personality, and vocabulary. They also need to be occupied well, supervised constantly, and stimulated more than their younger siblings. 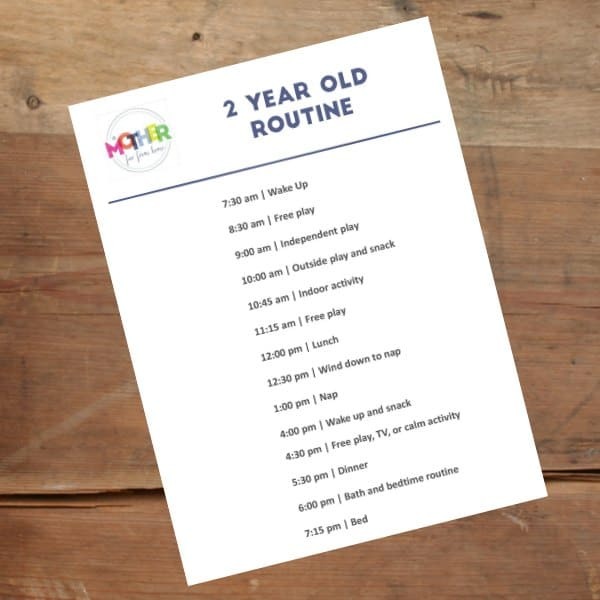 This 2 year old routine is also generally the one I use for my 3-year-olds as well, but this is the age where they come into their own. 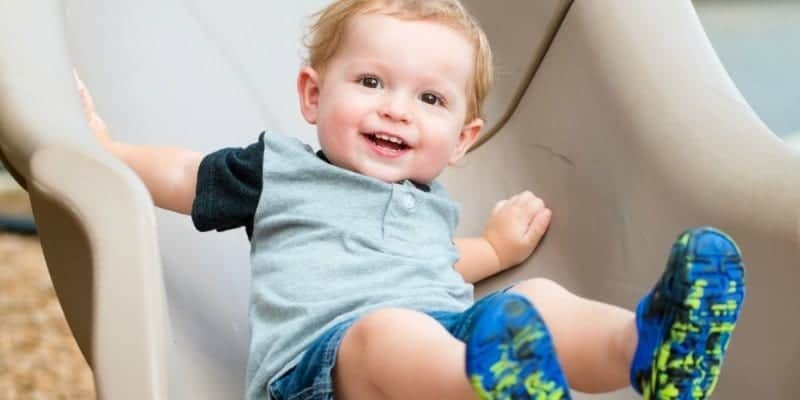 They’ve dropped their morning naps, are able to go with the flow a bit more, and can even play by themselves without constant monitoring for longer periods. Here are things to take into account when creating a good routine. 2-year-olds are their own breed. Whew. They are a lot of work, but they say the dangdest things, don’t they? Repetition | Toddlers need repetition and consistency. This is the easiest way to teach them to follow their routine without nagging. 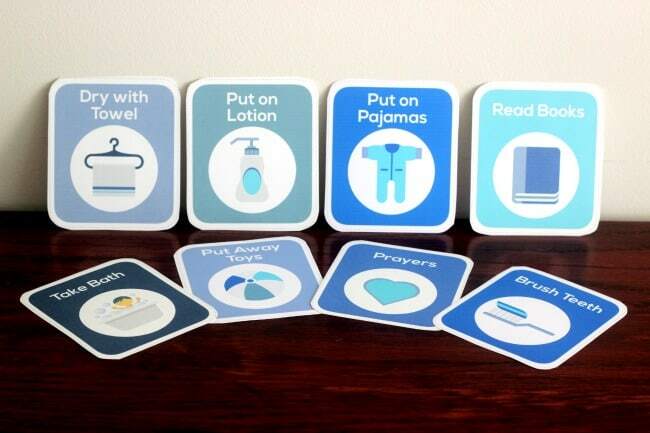 Boundaries | Your 2-year-old will push the envelope, test the waters, and find out where the family boundaries lie. This is good all around, but does require consistency on your part. Emotional help | There are big emotions going on at this age. You’ll need to both hear them out, make them feel understood, and teach them how they are allowed to express their emotions and how they are not. Sleep | 2-year-olds still need a nap. They’ll try to pretend they don’t and will even go a few weeks at a time where they lay in the crib talking to themselves instead of sleeping. Persevere, don’t give up, and they’ll nap again soon. 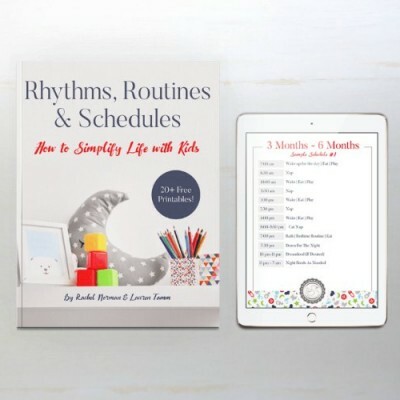 Routine | Never is a routine more helpful than when your child is growing so much developmentally. Again, you don’t have to be hampered by the clock, but find something that works and stick with it. Now, if you are not a “clock oriented” person you’ll be very interested to read my post on how South Africans manage their time. This will give you all the benefits of a schedule, but that may better fit your own personality. Because, no matter how good a routine is for your child, if you can’t manage to keep the routine, then you’ll be the one who’s frustrated! Even if my toddler wakes up a bit early, he stays in his crib until this time. This is breakfast time. Awesome tip: when you serve breakfast is when their metabolism signals them to wake up. If you feed them at 5:30 am they’ll wake then. I’m a stay-at-home-mom so I know this time won’t work for everyone. This clock might help if they are an early riser. We do breakfast leisurely. We eat slow, put dishes away slow, and mosey away from the table slow. After that I let the kids free play for a bit to ease into the day. I try not to let this go on long enough they start fighting and going nuts, but I let them figure out what they’d like to do next whether it’s riding bikes, playing with the bunny, or just messing around with toys. You can find age appropriate bestselling toys here. Now, depending on the season, this time slot may change. 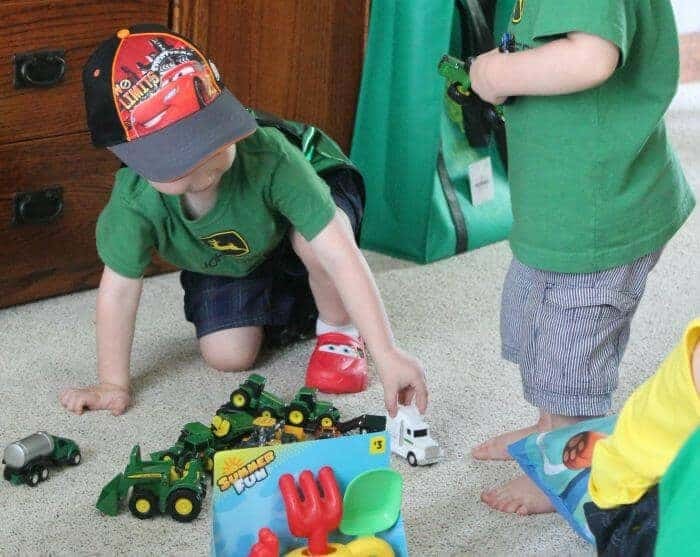 Independent play is essentially letting your child play alone with their toys uninterrupted by you or siblings. I try to have this happen daily. If your kids don’t know how to play on their own, this will help you teach them how. If we skip snack time, things go haywire. I am okay with letting the kids go hungry on occasion. However, without a proper fulfilling snack they may stand by your side begging for veggie sticks or grapes until you want to bang your head against the wall. I love sending them all outside. We have a designated fenced play area, but if it’s summer we’re by the pool all morning or in the front yard with the hose and the dirt. I don’t do an indoor activity every day. And, the days I do, “activity” is loose over here. This can mean building together, reading a book, or even doing chores. There will be a time during the day when you need to do something structured or – at least – led by you. This is character building, helps teach them to obey instructions, and means they aren’t trying to find something to get into or throw in the toilet. I let my son (who is currently 2) find something he likes to do and either let him at it or join in if I’m able. On the days when my mother’s helper (2 mornings a week) is here, she will often play with him. This might be Spot It or it might be trucks in the dirt. I aim for lunches that are filling enough to last through a good long nap. I don’t do short order cooking, but I try to offer quite a few filling options on their plate so even if they don’t eat it all (and since I don’t engage in meal time battles) they are still fairly full. After lunch, I have them put their dishes in the sink or dishwasher (ahem, if I’ve emptied it from the night before) then we mosey down the hall to get ready for naps. 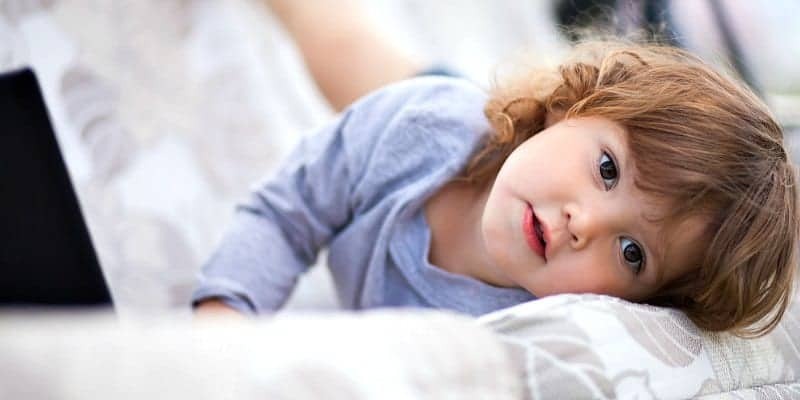 Naptime can be a struggle if your child isn’t “Buying In.” Here is how you can get your child to buy into their routine. This doesn’t always pan out as I hope, but all in all I try to utilize this calm down method or have someone else (if they’re around) read to some of the kids so I can get the others to their rooms. Here are some wind down routines for bedtime and many apply to nap time as well. It doesn’t always happen at exactly 1, but 1 is the goal. This means by around this time all the kids are in their rooms with lights out to nap or, those who are old enough they don’t need a nap every day, have a few quiet activities they can play independently. My 5-year-old may only nap once a week, and my 4-year-old only 4 days a week or so. The time at which everyone wakes up varies. If my older kids aren’t napping they can come out of their rooms after a couple of hours and do something quiet. Or they often go into each other’s rooms to play quietly. Often all the nappers will sleep until 5:00 pm if I let them! I’ve found waking up cranky is remedied by a quick snack (not too filling or sweet). If the weather is good the kids may play outside. If we are currently watching TV each day for a bit (I go through seasons where we do no TV all week except movie night for this particular reason) they may watch TV. I like when the kids offer to help with dinner, but I can’t have all the kids underfoot so rotating which child can help avoids this and allows you one on one time. We aim for eating between 5 and 5:30 pm. This is early, I know, but means we aren’t in a manic panic to do the wind down routine and the kids still get to bed at a reasonable hour. Reasonable being between 7 and 7:30 pm most nights. This works for our family. If we haven’t swam that day then it’s usually bath time, books, pajamas, and calm play before bed. That said, kids will be kids and calm can turn to chaos quickly. My husband and I conquer and divide so each child can have a few minutes alone with each parent before bed. These wind down routines are key for babies, and I normally get baby duty. A mommy privilege! Sometimes this is a bit earlier or later, but around this time most kids are in bed. My 2-year-old may often stay up and talk to himself (or sing God Bless America) in his crib if he’s had a late nap, but we’re okay with that. He doesn’t cry or fuss so it’s less stimulating and more relaxing (not to mention consistent) for him to be in bed at similar times. This may be so simple it goes without saying… but the key to a good routine is keeping the routine. 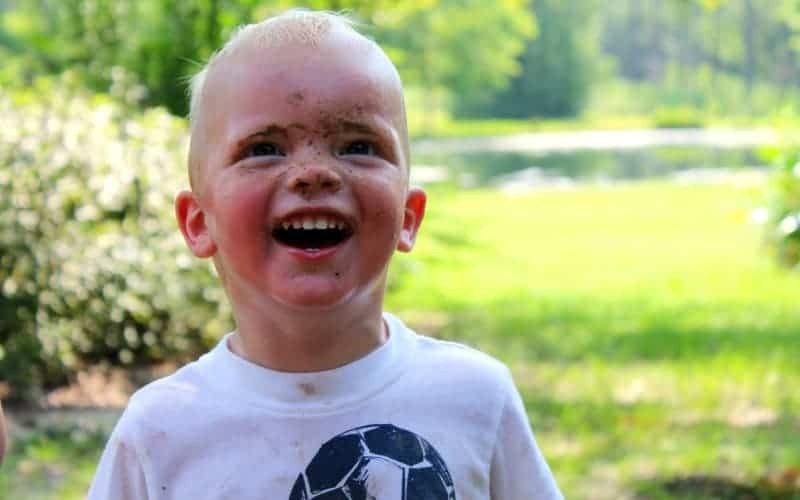 It can be hard to remember what all you want to do with an energetic two year old running around, but once you get the hang of it, routine will be second nature. 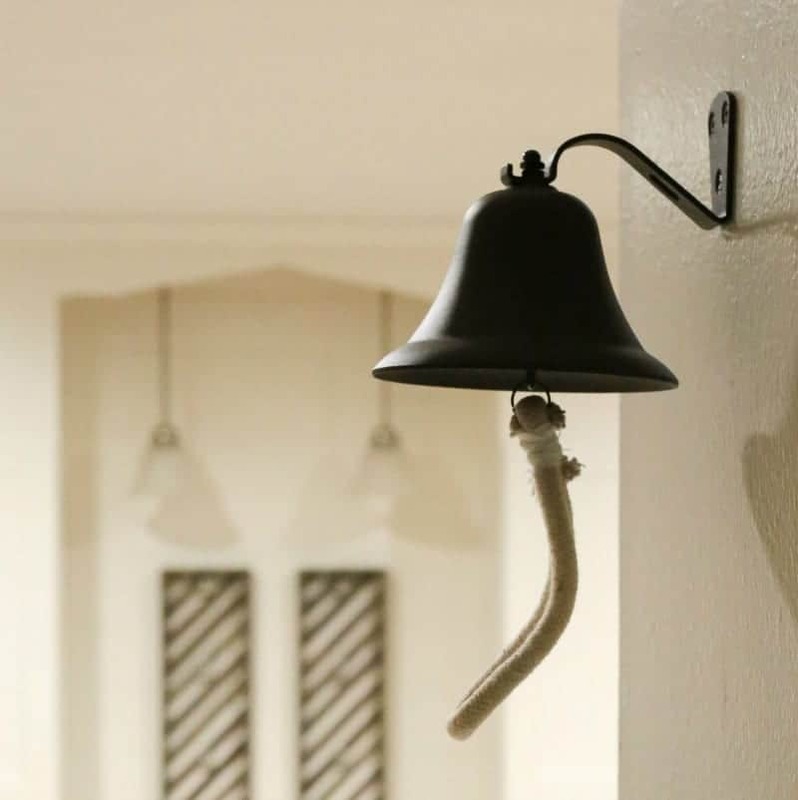 Here are some ways you can learn to keep your routine without the hassle. 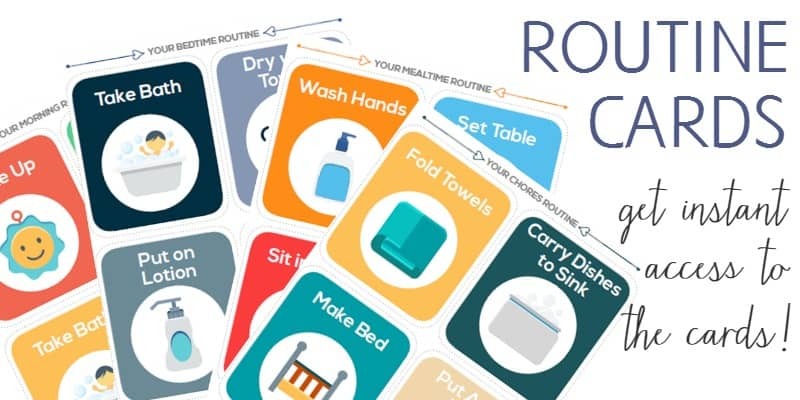 If need help remembering the routine and want to teach your budding toddler to follow the routine at the same time (so you don’t have to nag) I recommend using our routine cards (shown below) or something similar you can whip up at home. You hang them up in the appropriate room (bedroom for morning routine, bathroom for bath routine, kitchen fridge for mealtime routine, etc.) and then use them to help your child learn independence. As with anything, if you want something to work then work it. Keep pushing what you’ve decided to do. If it doesn’t work then change it up a bit and keep going. Move forward. I assure you 100% that a routine will work if you keep at it. Want a copy of this routine in your inbox? If you’d like a version to print and hang up then sign up below and I’ll email it to you. I’ve repeatedly tried, but my almost 3 year old hasn’t napped since he was was two and a half. He’s very headstrong and I’ve tried all the calming tricks to get him to sleep. Doesn’t work. His little brother naps 2.5 hrs every day like in your routine. It’s the reason why I struggle most days as from 7am until 7.30pm he’s full on and not in nursery yet. Sigh…I miss nap time. Suz, will he do independent play in his crib during that time? I’m sure you have, but have you tried moving naptime up by an hour or two? Hello, this is pretty much the same routine for my 2 years old son except that we don’t have a garden so we aim at going out twice every day – to the park , playground , meeting other mums with young children etc. 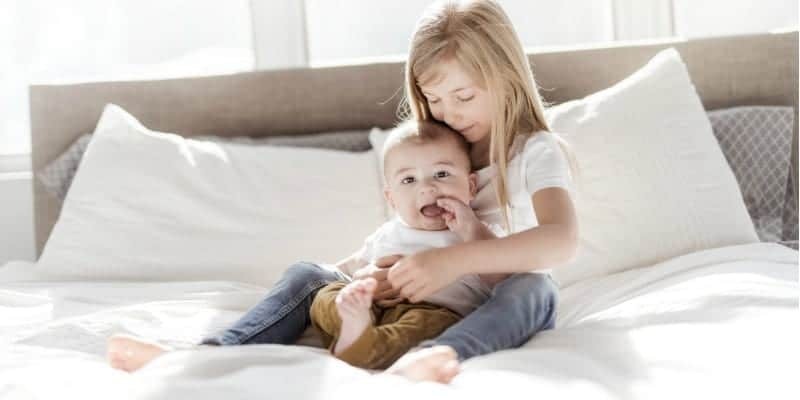 One thing – how do your children manage to go to bed at 7pm every day after sleeping until 4 pm since 1pm ( for 3 hours)? If my son sleeps til 4pm then he won’t go to bed earlier than 9pm. His nap is between 12-3pm and he still can’t sleep at 7pm. This was the thing that struck me too! My two-year old appears to need a full six hours of awake time after her nap before she will fall asleep. She likes to nap from one until three pm, but then doesn’t fall asleep until 9pm. I am bowled over by how much sleep your kids get. Thanks for sharing your schedule. I’m working on implementing this routine. I am a very haphazard person, so following a routine for more than a few weeks at a time is a struggle. The girls do better with it, so I will do nothing less for them. One question: I’d love to ship them outside every day, but where I live we’re getting to a point that I can’t send the big one (2.5) out alone, and the little one gets extremely chapped even with cold weather gear and vaseline if we’re out for more than a few minutes. Suggestions? Karen, I’d help with that but I’m in Florida so it’s fairly hot all year. We do struggle when it’s super cold because it’s a hassle to get dressed but the only advice I can offer is the old saying “it’s not too cold, you’re not dressed warm enough. ” Ha! Your routine is identical to ours! I have a 3 year old and a 2 year old and a 5 month old. I recently gave my 2.5 year old a big boy bed and he has been awesome about staying in it for naps and bedtime except early morning. He has always been an early riser and I have never gotten him before 7 since he was a year old. If he wakes up at 5:30 I just let him talk. I don’t even poke my head in unless something is clearly wrong. Nothing has changed! After all that training and being as consistent as it gets he still wakes. Only problem is now he can get out of bed at 5:30 and open doors. We gave him my daughters ok to wake clock and he doesn’t seem to get it or he’s just disobeying I haven’t figured that out yet. How do you suggest solving this problem? Tina, I’m not suggesting *you* do this, but let me tell you what I did. I put a door in front of my son’s door! He would come out and be quiet so I wouldn’t hear him. We have a busy road, a pool, and a pond so…. IT IS SERIOUS if my child is wandering unsupervised. You can get child locks to make sure he just can’t get out. Again, you may not need this, but I did. This is such a great idea! I have a 2 year old, and was afraid it may be too late to start a routine for him, as he doesn’t really have one now. I have never gone by a routine myself so it has always been a struggle to go by one with my little one. I just really hope it’s not too late. Never too late, and you don’t have to do a strict routine at all. My daughter is currently 20months. We have no routine but I would really like to start. Staying at home with her with no routine has become very draining. Nap time and bedtime has been a disaster since she was an infant. To this day she still screams and cries as if she is completely terrified of her crib. I’ve tried rocking her to sleep at night as well as leaving her to self soothe. Neither seem to work. And she always wakes up in the middle of the night. All of this has led to her sleeping with me. Sabrina, have you taken my free routine series offered at the bottom of this page? Ahh..order..i have been trying to get a routine going..thank you for sharing this! What do I do with my 2 year old who thinks she doesn’t need a nap? Where do you fit in trips to the store? I have been doing a routine for my 2 year old for only a few months since the newborn arrived. Prior to this we traveled a lot which meant more inconsistencies. Would also love to hear how you plan vacations.. do you still try to maintain some routine? Eats breakfast, brushes teeth, and we are out waiting for the bus at 8:35. School is finished at 3:20, and he is home shortly after that depending on if I walk to grab him, or my husband picks him up on his way home from work. We aim to have dinner between 5-530. Then is bath time, followed by a snack. Then into the bedroom (my older two boys share a room) where we read two quick stories. My 2 year old is now in a toddler bed, and needs to be sat with until he falls asleep. Then I usually go and get the baby ready for bed. But because I don’t have anything roughly in place for her during the day, she isn’t napping at consistent times so sometimes she will be napping while we eat dinner at 5, and then it’s difficult to put her to bed at bed time. Seems like 1 to 4 is A LOT for nap time , isn’t it ? Another question, if a 2 years old napped for 2 hours, how long after waking up do you think he should be In bed again for his night sleep? Rachel, depends on the baby. some of mine are super sleepy and some aren’t! If they go down at 1 and sleep until 3:30 I would usually have had them in bed by 7 o r 8 at the latest! Hard for me to believe that you can make a two year old finish their meal in just 30 mins. Adults take more time than that. If this is true…. Please share how you do it. Seems like distant dream to me. Through my own fault, my 2 year d is now obsessed with watching Peppa Pig. She would watch Peppa Pig all day if I let her. When I say no or turn it off, a major tantrum erupts. Apart from simply not turning on the tv, any suggestions to stop the addiction? Do you give your 2 year old a snack/milk before bed time? My 2 year old wouldn’t be able to eat dinner at 5pm and then wait until 7:30am to eat again. This routine is nearly identical to what our day looks like with 2 yr old twins. I love it! You describe the what’s and why’s beautifully. Thank you. I’m excited to share your site with my sister-in-law who just brought her newborn home. when do you go to the store or run errands? leaving the house (especially with all the kids!) always takes SO much time and is my least favorite task of the week. i’ve learned to online clothes shop and then return the things that don’t work, but some things like shoe shopping doesn’t work very well like that. And we all have to go to the grocery store, right? I would like to know this answer as well! 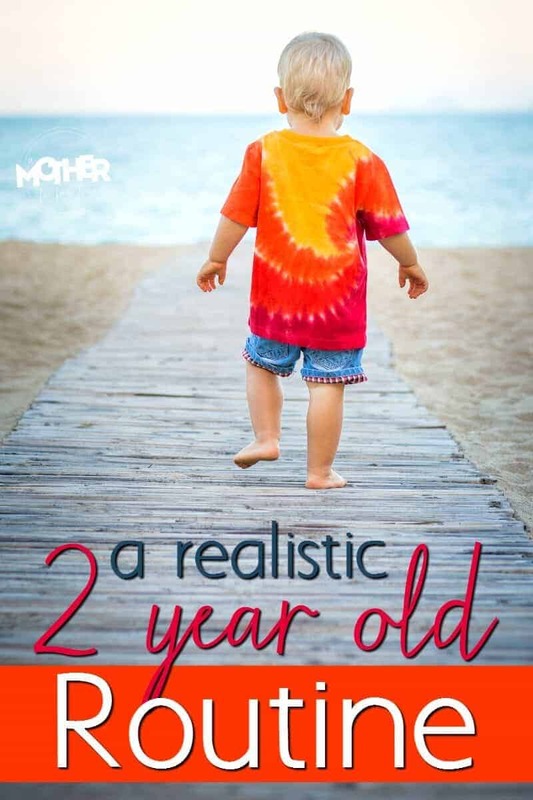 I have a 21 month old! We do not have a routine! She normally takes a nap around 3 or 4 o’clock! She normally doesn’t go to bed at night till 9 or 9:30pm! How do I get her to stay asleep at night! So when do you do laundry and stufff? When do you have a break for yourself? After they’re in bed or whenever I get a free moment. I don’t schedule in household tasks because I’m not quite that structured in the hour to hour! i live with my daughter, her husband and my 20 month old grandson. have watched him since he was born. (in full basement) she brings child to me at 6am (she has to be at work by 7am)he is wide awake and i am just waking up. suggestions for schedule?? ?i keep him till 4pm, when dad comes home. Long day – need ideas. also i am 68yrs old. Isn’t a bedtime of 7:15pm to close to their nap time waking of 4? My 23 mo old needs at least 5hrs in between naps& bedtime to fall asleep & be tired…. she naps from 1-3 but won’t go to bed till 8:30/9 which is toooooo late for me!!! How can I get her to bed sooner!? 7pm bedtime?!? Lol what the?! Our 2 year old goes to bed EARLY at 10-1030pm. Guess every family is different but her 11pm-Midnight bedtime works like a charm everynight! It is 430pm now and she just went down for her afternoon nap. Do what is best for YOUR family and YOUR child not just what everyone else does. Just saying. So your younger kids are getting 15 hours of sleep in a 24 hour period? I wish my 2.5 year old son would come even remotely close to this. He sleeps 9:30 or 10 pm to 5:00 am, wakes to nurse then maybe back to sleep until 6:45 am. He naps usually from 1 to 3 pm, though lately he has moved back to 3 – 5 pm nap time. He has never been a good sleeper so even this is better than before. Help, I am so tired. My daughter is 20 months old. She used to go down to nap really well, straight after lunch, and sleep for 2 hours. Well, the last couple of weeks she has not. I’ve continued to put her in her cot after lunch, but she doesn’t sleep, and doesn’t act like she’s tired either?! I know she should be napping, but she just won’t. Sometimes she’ll be in there for an hour and I’ll give in. I don’t know what to do? Do I lea e it till later? When she’s in her cot she often just talks and shouts. Eventually she’ll start crying… although it’s not a proper cry. I need a solution because I need these naptimes!!!! Hey, I Have a two year old and one on the way, we’ve had to do a lot of moving in a short period of time but now we’re stationed. Because of this we’ve never really gotten into a routine, or we’ve had really hollow walls and complaints of our baby crying in the night so we did a lot of comforting and feeding when really we shouldn’t of had to just to try and keep her from crying. Well it’s bitten us all on the bum and our daughter wakes throughout the night quite a lot not always for milk so we go to her but doesn’t always help I’ve tried to follow her routine and we seem to get someone for a week or so of good nights and mornings and then out of no where we start from square one. Just in desperate need of help and she’s very stronger willed bless her haha. Sounds like you really know your own child, knowing the times that would work for him! Wow, this seems like an amazing Mom life to have. Wake times at 7:30am, 3 hour naps and they would sleep till five if you let them? I have to wrestle my 2-year old to take a 1.5 hour nap. On an extremely lucky day, she will sleep two hours. That is like a fluke day. Many days she wakes up 45 minutes into her nap crying, and she may or may not go back down. She wakes up every morning between 4:30 and 5:30am. Nothing I have done changes this. By 7:30 I have been up for 2.5 hours!! Hah! I live in an apartment so there is no backyard that I can just let her out to go play. 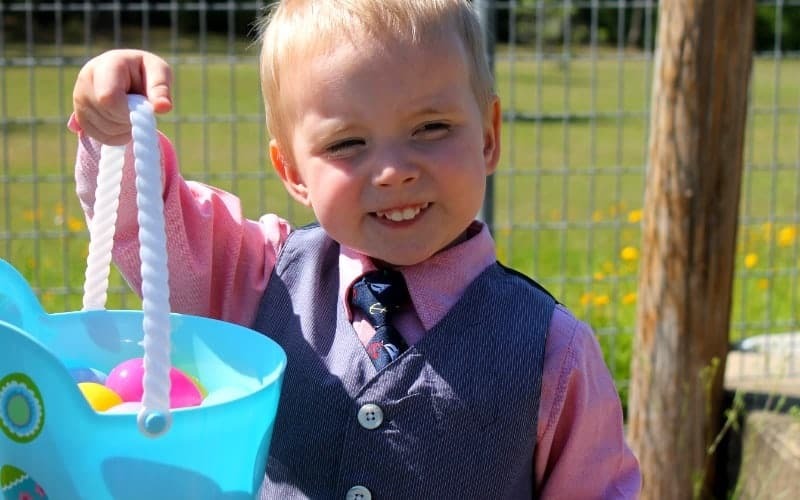 How do you deal with a 2 year old who always goes down for a nap from 1:30-4pm… whose older sibbling is started kindergarten this fall and who has to be at school by 7:40am and isnt dismissed until 2:10pm? We dont even get out bed until 7:15am! I am going to end up homeschooling because the kindergarten hours seem like a pain to deal with! My almost two year screams when out in the crib and never tires herself out. She will scream for an hour plus until I eventually give up because I don’t feel good about how many hours my 4yo has been downstairs alone. Checking on her doesn’t help. Leaving her alone doesn’t help. Books in crib don’t help. She usually is up 6am-7pm and only goes to bed then after fighting the crib and eventually being rocked to sleep by my husband and I after the screaming makes us feel nauseous. I was very confident about sleep training my older daughter as early as 6 months (it was honestly easier to let her cry it out bc I had postpartum depression and also my mother was big on sleep training). But this second time around I have read so much about the negative effects of sleep training. Please help. What do you recommend to do when my 3 year old wakes up (around 6:30-6:45 am) and runs into my room. Walking him back to the room doesn’t work, he is up for the day. At this point he goes potty and wants to play in my room. How do I keep him in his room for a bit longer and not waking me? it just sounds so perfect that is hard to believe, your 4-5 year old play by themselves in their room from like 1-4 pm is my understanding, wow! and then if your child is napping for 3 hours ( the 2 year old ) is ready for bedtime just right after 7pm? just perfect!!! so from 7 pm to 7 am is like what 12 hours and then plus 3 more is 15 hours in 24h period for a 2 year old ? I would love to have that time of routine, but i’m sorry never ever heard from anyone about such a perfectly strategic day, good luck to anyone who will follow!!! I am at a loss. Your schedule is EXACTLY what we used to do until we had baby number two (now 4 months old) Now sleep is a huge struggle. We are forced to put them down in separate rooms and then move my two year old into her bed once she is asleep at night. Sounds easy enough, but two year old will do anything to make as much noise as she can before bed so we have to monitor her until she falls asleep as not to wake baby and actually get to sleep. How do you manage this schedule with two in the same room? ?